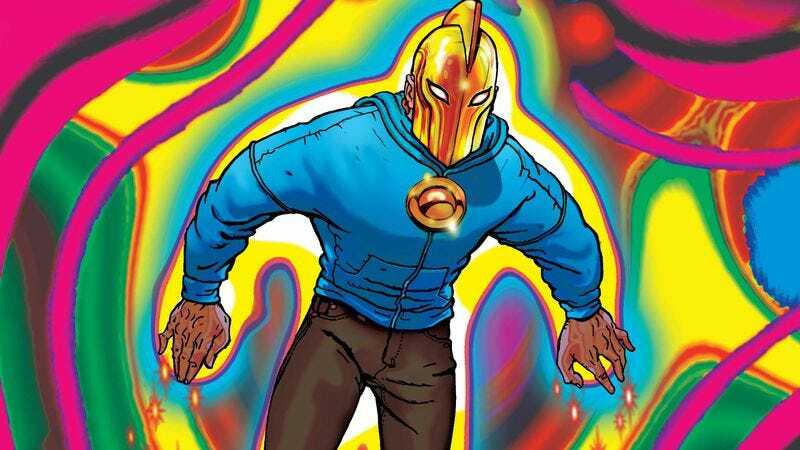 There are only two issues of Doctor Fate left, and it will be sad to see this heartfelt, visually striking series go. Writer Paul Levitz has been a major player at DC Comics for decades, and his imagination was revitalized by the adventures of Khalid Nassour, resulting in some of the best writing of a storied career. He’s carefully tackled politics and religion while building a compelling new cast of characters, and he’s been gifted with phenomenal artists to realize his vision with creativity and style. Levitz actually shares a storyteller credit with his artists, and that heightened level of collaboration is largely responsible for the success of this series. Last month’s issue saw the departure of main artist Sonny Liew, but DC has brought in an exceptional talent to replace him for the book’s finale. Brendan McCarthy is known for his psychedelic aesthetic and bold designs (he helped write and design Mad Max: Fury Road), and these preview pages of next week’s Doctor Fate #17 are a stunning showcase of his talent. Working with colorist Mark Harrison, McCarthy immediately brings a surreal quality to the issue with an off-center opening splash surrounded by trippy graphic elements, and those strange backgrounds foreshadow the weirdness to come as Khalid’s magical abilities detect deadly forces during a rally at Freedom Tower Plaza. The color in these pages is especially powerful, and it’s going to be exciting to see what kind of mind-shattering visuals McCarthy and Harrison deliver once Khalid leaps into action to save his friend’s life.